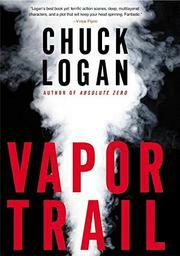 After four Logan winners, this diffuse potboiler about a vigilante serial killer disappoints. The targets: child molesters. And what’s wrong with that, you might ask? But if you’re a cop, you really shouldn’t be among them. And if you’re a cop, you absolutely shouldn’t be the triggerman—which brings us to the two a.m. phone call Phil Broker (in a sequel to Absolute Zero, 2002) gets from old friend John Eisenhower, Washington County (Minn.) sheriff. A priest with a checkered past has been shot to death in the confessional booth—the m.o. strongly suggesting that the Saint may have struck again. The Saint? A nickname fondly bestowed by those members of the media who view trial by jury as, on occasion, optional. And there’s evermore reason to believe, the sheriff tells Broker, that the Saint (in repose) may be police Sergeant Harry Cantrell. Some months back, the sheriff reminds Broker, there was the headline-grabbing Dolman case, in which a child molester managed to escape conviction though the evidence against him was overwhelming. Cantrell had been the arresting officer—and quick to claim a flagrant miscarriage of justice. And equally quick, many believe, to rectify it by pumping 12 bullets into Dolman’s body. Even if Sainthood doesn’t quite fit, the sheriff believes Cantrell has information he’s chosen not to share with his boss but that Broker, his former Vietnam War comrade-in-arms, might somehow pry loose. Citing past favors, Sheriff Eisenhower wants retired cop Broker to pin on a badge as a “Special Projects consultant.” What’s left unsaid, though tacitly understood, is how dangerous a man Cantrell can be when crossed. And that Broker and Cantrell, ex-comrades-in-arms, are now the bitterest of ex-friends. Begins well but loses its way early and never recovers—stymied by unfocused plotting and a jumble of unrealized characters who seem to have wandered in from other stories.